In Chapter 4, I introduce the theoretical and methodological approach. I start by discussing how the theory of procedural justice is brought to a new setting and how it requires an extended methodology to more fully understand what people expect from an ADR body. Here, legal socialization and legal consciousness are proposed as concepts to enhance the procedural justice findings from the data. The argument I advance in this chapter is that, to get a better understanding of people’s expectations, attitudes, and perceptions of fairness towards/within a system of informal justice, a mixed-methods approach facilitates an examination of unexplored areas. 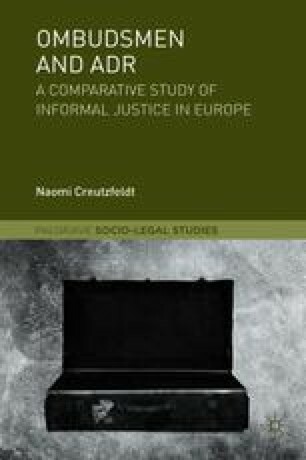 This approach is able to provide a richer account of what is happening in everyday encounters with institutions of the informal justice system. In sum, this chapter lays out the theoretical and methodological considerations for the empirical evidence to follow in part two.